The National Weather Service has confirmed that a small tornado touched down in southern New Jersey on Thursday. The Weather Service said today that the tornado passed through a portion of Plumsted Township, Ocean County, about 15 miles southeast of Trenton.The tornado lasted about five minutes and traveled two miles, with maximum wind speeds reaching 90 mph. 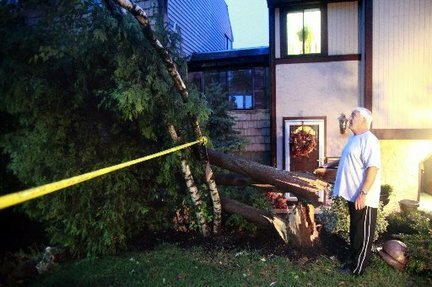 No injuries were reported, but numerous trees were knocked down and two houses in the mostly rural community had major roof damage.The tornado was spawned by a line of fast-moving storms that knocked down trees and power lines in parts of New Jersey and caused extensive damage in New York City.